George Graham Reviews Asa's "Beautiful Imperfection"
The world music scene takes many forms these days, from traditional folk music of Third World countries to sophisticated mixtures of very diverse cultural influences. Sometimes, a performer from one of the locations one usually associates with world music will do music that is rather Western in sound, but with some interesting twists. Perhaps one of the best-known examples is the Nigerian-born pop singer Sade. This time we have an artist with a similar background who also creates music that has an outwardly First World pop sound with some creative and eclectic twists. Her name is Asa [prounounded "Asha"] and like Sade, she also has a Nigerian background. Her real name is Bukola Elemide and she was born in Paris to Nigerian parents, who took her back to Lagos, Nigeria at an early age. She grew up there. At age 12, her parents sent her to one of Nigeria's best schools, where she studied music, but also expressed some frustration with the program. Her lower-pitched alto voice did not fit well with church music, and as a bit of a musical iconoclast, she had trouble fitting in. After returning home, she soon found herself drawn to American soul and hip-hop artists, along with some of the contemporary African artists like Femi Kuty and Angelque Kidjo, from Benin. She eventually moved to Paris to try to make her way into the music world. Paris has had a rich cross cultural scene, especially among African artists who have recorded there extensively. Asa, whose stage-name means "hawk" in the Yoruba language, soon found musical kindred spirits and after being signed to the Paris-based Naive label, she released her first CD in 2007, which soon attracted attention in Nigeria and elsewhere. She toured extensively, including in Nigeria sharing the stage with pop artists like John Legend as they toured the country. 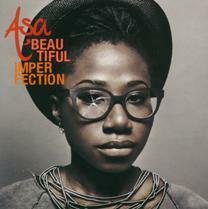 Asa's second CD Beautiful Imperfection was released internationally last fall. Now it's out in the US, and it's an opportunity for American listeners to hear this talented, creative and charmingly eclectic singer-songwriter. The African influence is subtle, except for the two tracks sung in Yoruba, but the Western influences make for a distinctive combination. There's a surprising amount of retro-soul sound to the music, hinting at Motown at times, and at others like a Burt Bacharach song. There are songs with a slide guitar a trombone and a string quartet. There are a couple of tracks with the sad-sounding Central Asian instrument the duduk, and while the beat can be bright and sunny. Lyrically, the CD sometimes has a kind of hippy "let's sing and make the world better" quality. Asa's vocals can often have a charmingly whimsical sound. On the CD, the producer and arranger is Benjamin Constant, who is often heard on a variety of vintage electric keyboard sounds. Other musicians featured prominently include guitarist Roman Chelminki, bassist Laurent Vernerey, drummer Regis Ceccarelli, and percussionist Nicolas Montazaud. Together they make music that you don't have to be a world music fan to relate to this CD. In fact I would say that the dominant quality to the music is retro, with lots of tips of the musical hat to Motown, and other 1960s pop influences, including occasional hints of the Beatles. Beautiful Imperfection, the new second CD by French-Nigerian singer-songwriter Asa is a thoroughly enjoyable recording by a creative artist whose musical eclecticism is tempered by the ability to come up with infectious pop songs. She's got a charming voice and musical persona, and the excellent backing musicians and arrangements contribute greatly to the CD's charm. Our grade for audio quality is close to an "A." The mix is clean and fairly intimate in sound. The CD was mixed by American engineer Tchad Blake, who spared the studio effects he is sometimes known for, instead letting the music stand on its own, and not trying to give a retro sound quality -- i.e. analogue defects -- to the recording. The dynamic range is decent for this kind of music. Sometimes world music can sound intriguingly exotic, and sometimes the influences come together to make for music with wide appeal. Asa's new CD Beautiful Imperfection is definitely one of the latter. I suppose one could say it's a pop album for thinking people.